I’m excited to announce that next Wednesday, June 8th, I’m going to have a special treat for you! Wendy E. Simmons, author, will be appearing as a special guest blogger* on my website and social media pages. Wendy’s new book, “My Holiday In North Korea – The Funniest/Worst Place on Earth” chronicles her adventures in North Korea as a solo traveler. You heard that right, not only was she one of the few Americans to experience North Korea but she went there alone. I’ve read the book and really enjoyed it and I think you will too. Please watch for her guest appearance here less than one week from today! Wendy’s website can be found here. *Please contact me at – ericvancewalton@gmail.com if you would be interested in becoming a guest blogger. After two decades in this business I realize that writing will either; 1. break you; or 2. polish away your imperfections and make you a better human being. Sometimes getting to number 2 requires number 1 to happen first. No matter what life throws at us, there’s never not a solution. Life will show us the way (sometime’s it’ll even kick us in the pants). Our only job is to be awake enough to see it and be willing to do the work. I can tell you first-hand, the glorious lack of regret is worth every single ounce of the pain. All of us can think of at least one talented artist (musician, writer, actor, etc.) whose creative prowess peaks a few years into their careers and they spend the rest of their lives chasing their former glory. As a creative person myself I always feel horrible for both them as well as the loyal fans who follow them down the death spiral of their careers hoping their heroes will regain their glory. Many times these people just can’t seem to free themselves from the gravity of the spiral and their work gets progressively more and more out of touch. They eventually become irrelevant, or even more tragically, a societal joke. I’ve heard many excuses as to why this happens, among them are laziness, too much of the good life, a creative dry spell, burnout, old age. What do I say about these excuses? I call bull$h!t…quite literally. I think all of these excuses are merely symptoms caused by two different kinds of bull$h!t. I’ve been writing for decades and have recently had the good fortune to finally achieve a small taste of success. As a result of this I’ve suddenly realized how crafty bull$h!t is and how easily it can creep into your life. If you achieve even a small amount of success in this world inevitably people begin lavish you with praise and tell you how talented you are. Most times this praise comes from a altruistic place within the people who are doing the praising but occasionally it doesn’t. Sometimes people seek you out and will stroke your ego so they can manipulate you into doing things for them. These are the takers. The truth is when you begin to believe the praise from either source that praise turns into poison for both your soul and your career. As a creative person you must proceed with caution and become cognizant of which category the praise falls into. It’s difficult at first but gets easier to discern with practice. In a short amount of time you develop a sixth sense for spotting takers and they become easily avoidable. The altruistic praise is ten times more dangerous. We feel that it’s sincere and after struggling for so long it feels amazing to get this kind of attention. This sincere praise creates an emotional high that we begin to crave more of, if we allow ourselves to believe it. Some people become addicts and surround themselves with people who lavish them with praise. So begins the death spiral. The antidote to the bull$h!t is to accept the praise, be grateful to the praiser for it, then release it long before it has a chance to turn into bull$h!t. You see, altruistic praise only is recycled into bull$h!t when you begin to believe it. Ego is our kryptonite. Each time you believe it makes you feel as though you’re as good as you need to be. You feel as though you’ve finally attained your long sought after goal and you no longer need to learn, grow, polish your craft, and evolve into a better version of yourself. I liken this modern world to a treadmill, things move so fast that to stand still means you quickly fall behind. The only way for most of us to be truly successful and create a sustainable career is to wake up to the fact that we will never truly “get there”. Our work will never be quite done. We will be honing our craft until the day we die. In fact if this seems tiring and it feels like work we probably shouldn’t be doing it. I’ve learned that it’s truly never been about the destination, it has always been about the journey. This journey is exhilarating, I wake up every day with a new wish and a renewed sense of hope. Enjoy each second of your journey but just be careful where you step and that your meter is finely tuned. I’ve been writing poetry for over two decades and have published several books. 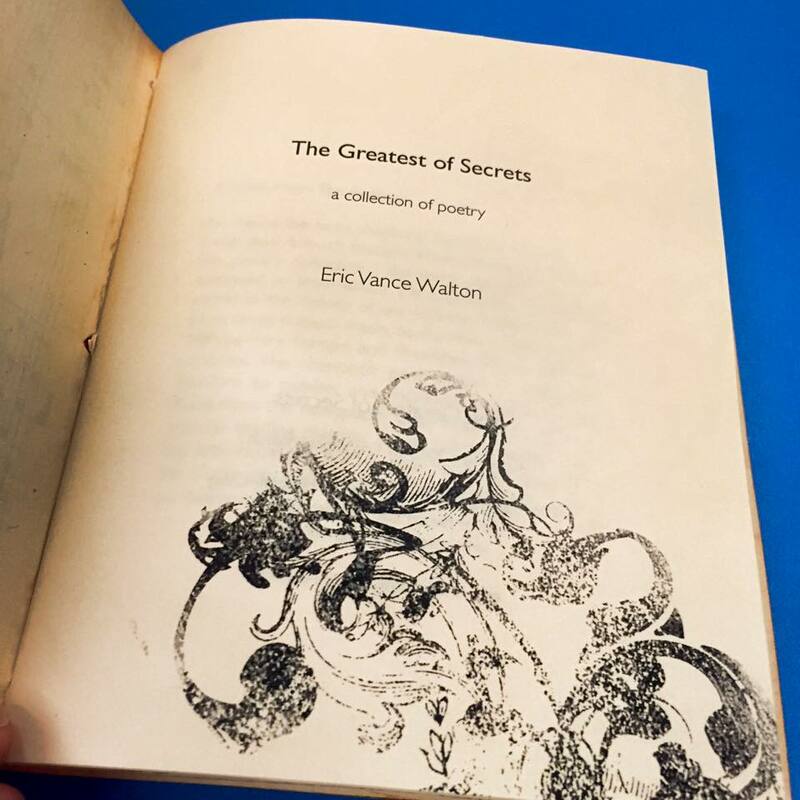 Google my full name (Eric Vance Walton) and you will see that my individual poems have been published widely in many publications and literary journals. I don’t promote this book much anymore. It’s not because I don’t like it but it’s already been in print now for a decade and I’m more focused on writing fiction now. I still believe in it. More importantly, I believe in the incredible power of meditation. • Easing and improving your ability to handle stress. • Allowing you to sleep more restfully. • Teaching you to appreciate the beauty that surrounds you. The Perfect Pause is a clear, concise meditation guide, and journal that will give you the basic tools necessary to discover life’s “pause button”. 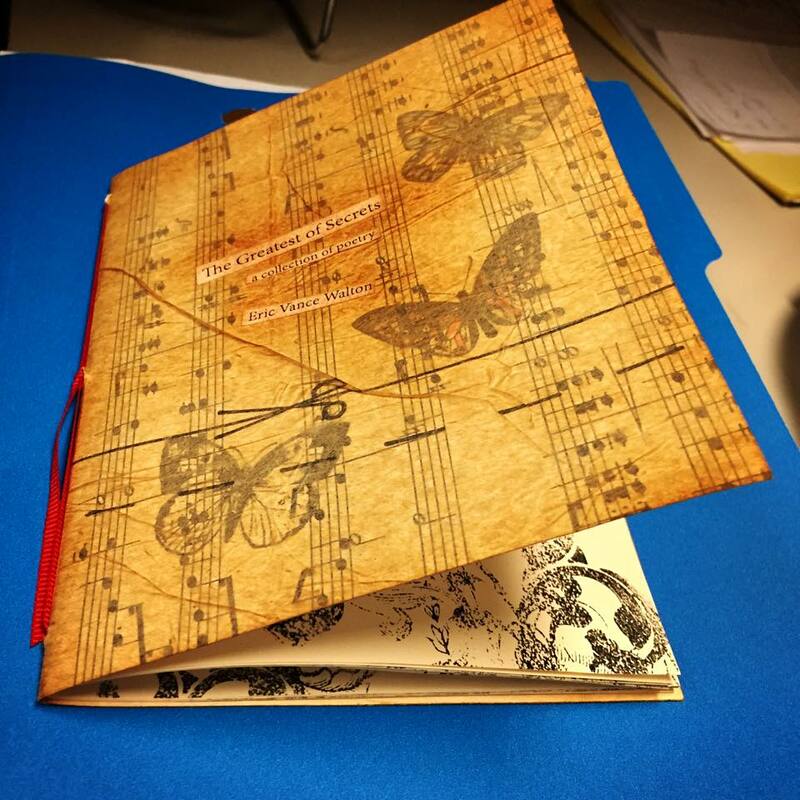 Included in the book is a three-month journal to chart your progress. This comprehensive guide provides a reboot to the rigors of our modern life! INDIE AUTHORS – For many of us, our writing careers aren’t built in quantum leaps but rather slowly and steadily. Bring your writing dreams to fruition, ONE WORD AT A TIME with my book on writing! Categories Ad•Tags Authors Publish, Eric Vance Walton, freedom with writing, Indie Authors, One Word At A Time: Finding Your Way as an Indie Author. I Present to you…The Greatest of Secrets! 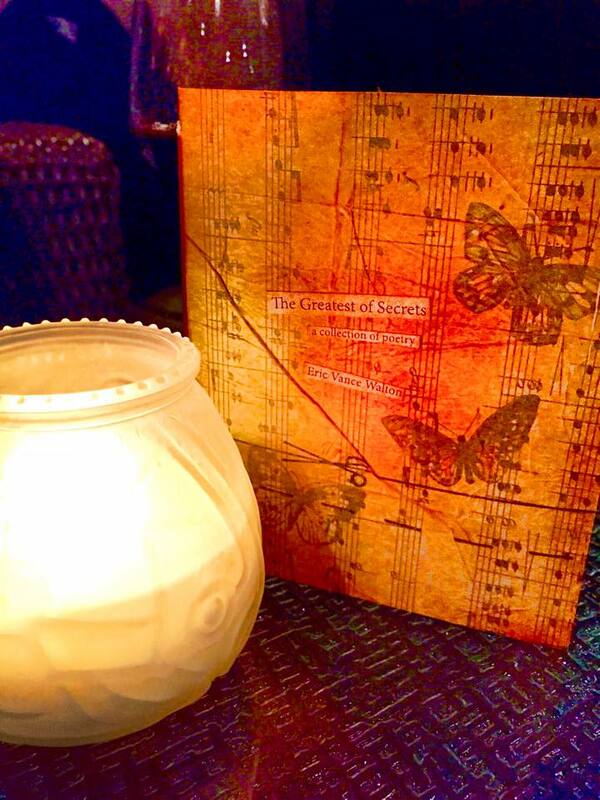 On Sale Now…my new poetry chapbook, The Greatest of Secrets! 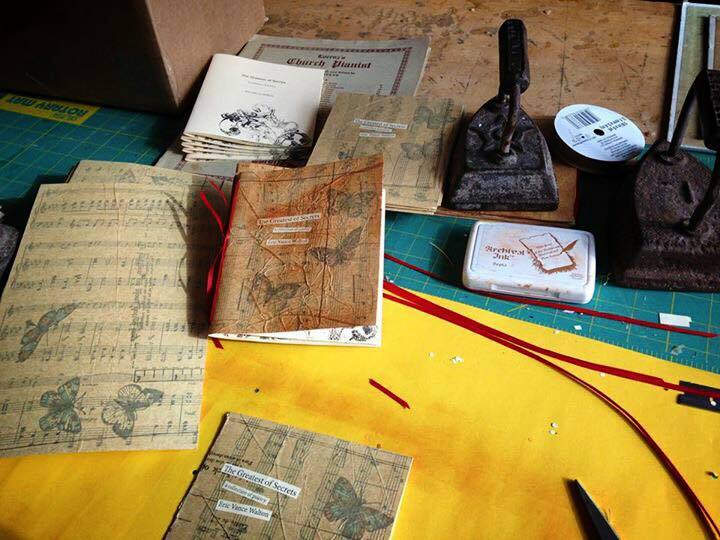 This beautiful chapbook contains more than twenty original poems suited for Valentine’s Day and is entirely handmade and bound.